There are no signs of slowing down for American stand-up comedian and actress Amy Schumer. You see her on television and film, but nothing beats the experience of seeing her standing right before you onstage, dishing out those hilariously fearless punchlines in your face! 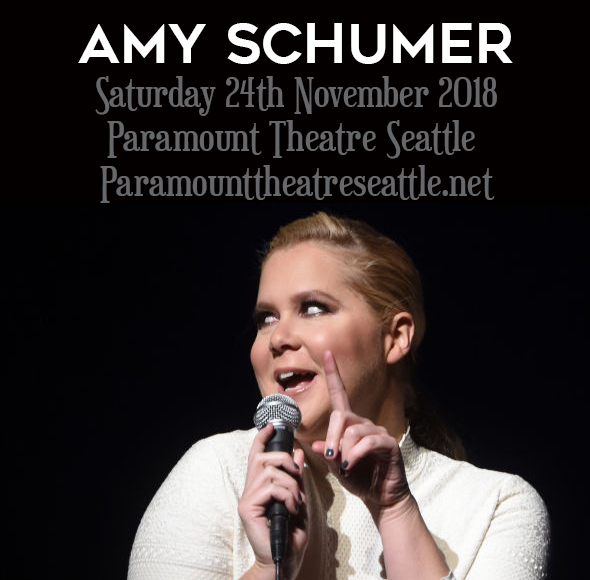 She's in a whirlwind of a touring schedule, so thank your lucky stars for Miss Schumer is bound for a stopover show on Saturday, 24th November 2018, at the Paramount Theatre Seattle. Break free from stress, indulge, and get a belly full of laughs courtesy of Amy Schumer. All you need is to sink your teeth into those tickets that are selling like hotcakes. Get it while it's hot and fresh! The future looks bright for a student voted both "Class Clown" and "Teacher's Worst Nightmare", in 1999. Well, Amy Schumer seems to be living up to her reputation and infamous citations to this day. Her fearless sense of humor and natural comedic timing has definitely gotten her places. Schumer started doing stand up comedy in the year 2004. She tirelessly worked at her craft until she got a significant break in the TV show, Last Comic Standing. Following the heels of her newfound success, she made further impact with her stint at Comedy Central during Charlie Sheen's roast. In 2015, she hitched her wagon to the stars with "Trainwreck", her debut film which she wrote and starred in. "Trainwreck" propelled her into box-office success, and also gave her her first Golden Globe nomination. Her film resume also include "Sleepwalk With Me", "Price Check" and "Seeking a Friend For the End of the World" . She also received a Peabody Award for her Comedy Central show, "Inside Amy Schumer," along with five Primetime Emmy Awards, winning Outstanding Variety Sketch Series in 2015. Amy Schumer was on a roll. She continued her streaks of success by publishing a memoir in 2016, "The Girl with the Lower Back Tattoo", which grabbed and had a two week run at the top of The New York Times Non-Fiction Best Seller list. Adding another feather to her cap were two Grammy Award nominations for Best Comedy Album for Amy Schumer: Live at the Apollo and Best Spoken Word Album for The Girl with the Lower Back Tattoo. Amy Schumer is unstoppable indeed! Thus, make sure to catch this live show while you can. Now, pick up the pace because tickets are moving fast. This is one LOL-moment you wouldn't want to miss!